Superstars like Kurt Angle come around once every generation. WWE are wisely putting Kurt Angle where he rightfully belongs in the WWE Hall of Fame. In honor of Kurt being the centerpiece of the Hall of Fame ceremony this year, we are gonna take a look at his best work in WWE. -One of the greatest technical matches in the history of WWE. Kurt Angle and Chris Benoit always had excellent chemistry and this match was a culmination of that. This back and forth affair saw these guys bring out the absolute best in each other with counter after counter. This is a wrestling fan’s dream match. This match doesn't get enough credit. This was a turning point in Angle’s career. Angle had been playing the clean cut cocky hero, but got involved with Stephanie McMahon. Kurt started sliding into being the second best heel in wrestling at this time and made HHH look helpless during this match, which was something no one had done at that point. The story crafted was basically Angle beating the hell out of HHH and that's something that's usually the other way around when HHH is involved. -Angle and Guerrero always paired well. Guerrero needed to put on a stellar match going into Mania as the WWE champ and who better to help him achieve that than Kurt Angle? The ring psychology and storytelling was brilliant. Eddie looked to be in serious trouble, but of course the charismatic high flyer found a way to win. -This has to be one of the greatest performances I've ever seen. Kurt Angle takes a nasty bump before the match starts and still finds a way to compete, concussed and all. The story between Kurt and HHH overshadowed the match but the storytelling was great. -When Kurt and Taker met in the 2000s, both characters were in the infancies of gimmicks. 6 years later, we get the absolute best version of Angle (wrestling machine gimmick) and possibly the best version of the Deadman (hybrid Deadman Biker gimmick). This match could've been at WrestleMania as far as I'm concerned because it absolutely lived up to the hype and then some. -This is one of the 5 best triple threat matches I've ever seen. Smackdown struck gold with this one. 3 guys hungry to prove they were the best. Undertaker had developed new life as the Undisputed Champion. Kurt had gotten new life after a shaved head and making Hogan tap out for the first time in his career and Rock was always on point. -The return match from WrestleMania (more on that later) was phenomenal. This time it was personal. Angle had just came off injury to regain the title and Brock, a proud champion in his own right, was pissed off. So pissed that the Beast was born. 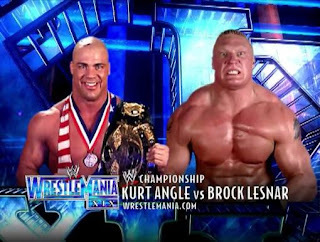 The story of Kurt coming in as the underdog was told so well with Brock growing into the Beast weeks prior to this match. Might be the most underrated match on this list. -Brock’s debut at WrestleMania was the main event. His rival? 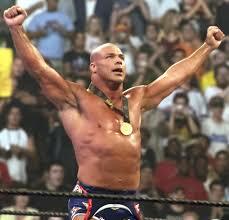 The man who is more accomplished in amateur wrestling than he is, Kurt Angle. This story virtually wrote itself. The match started out a bit slow, but picked up very much. Angle and Lesnar both almost suffered career ending injuries during this match which shows there was nothing they wouldn't do to put on the best possible show at the Show of Shows. 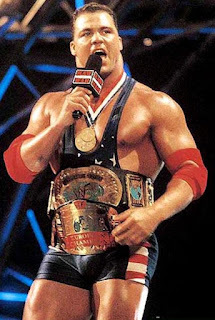 -Kurt Angle was considered a main event guy before the Invasion, but with so many top guys coming in and a returning Rock, it's hard to maintain your spot, but I feel Kurt Angle did it with this match. Kurt was thrust into the resilient babyface role for the first time in his career and played it to perfection. Austin always had good storytelling in the ring, but Angle shined here moreso than Austin. -With the terrorist attacks of September 11th happening weeks prior, America needed to be uplifted. America needed a feel good story. America needed a hero. Kurt Angle answered that call by winning the WWF title in an absolute classic. Kurt Angle and Austin always had great chemistry, but the story here is what made this match classic. In his hometown, Kurt did something that not many people (if any) can say they did: make Stone Cold tap out. -We have come to this. The match I feel is the best in Angle's WWE career. By far, the best WWE match (maybe best match period) of Kurt Angle’s career. A wrestling clinic was put on in this match. Shawn Michaels was always known to deliver like Fed Ex at WrestleMania and Kurt Angle decided he was bringing his best as well. Two styles diametrically opposed blended so well together. One wouldn't think we would see HBK tap at Mania, but here we are. Angle vs HBK at WM 21 was a gen of a match. And the other matches were just as great.